A true story of how a gentleman of a certain age and of respectable appearance was swallowed alive by the crocodile in the Arcade, and of the consequences that followed. Ohe Lambert! Ou est Lambert? 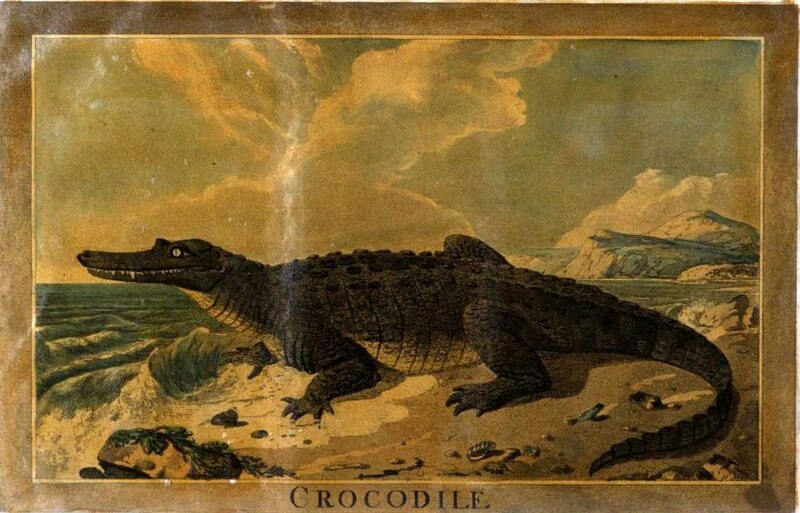 On the thirteenth of January of this present year, 1865, at half-past twelve in the day, Elena Ivanovna, the wife of my cultured friend Ivan Matveitch, who is a colleague in the same department, and may be said to be a distant relation of mine, too, expressed the desire to see the crocodile now on view at a fixed charge in the Arcade. As Ivan Matveitch had already in his pocket his ticket for a tour abroad (not so much for the sake of his health as for the improvement of his mind), and was consequently free from his official duties and had nothing whatever to do that morning, he offered no objection to his wife’s irresistible fancy, but was positively aflame with curiosity himself. “A capital idea!” he said, with the utmost satisfaction. “We’ll have a look at the crocodile! On the eve of visiting Europe it is as well to acquaint ourselves on the spot with its indigenous inhabitants.” And with these words, taking his wife’s arm, he set off with her at once for the Arcade. I joined them, as I usually do, being an intimate friend of the family. I have never seen Ivan Matveitch in a more agreeable frame of mind than he was on that memorable morning-how true it is that we know not beforehand the fate that awaits us! On entering the Arcade he was at once full of admiration for the splendours of the building and, when we reached the shop in which the monster lately arrived in Petersburg was being exhibited, he volunteered to pay the quarter-rouble for me to the crocodile owner — a thing which had never happened before. Walking into a little room, we observed that besides the crocodile there were in it parrots of the species known as cockatoo, and also a group of monkeys in a special case in a recess. Near the entrance, along the left wall stood a big tin tank that looked like a bath covered with a thin iron grating, filled with water to the depth of two inches. In this shallow pool was kept a huge crocodile, which lay like a log absolutely motionless and apparently deprived of all its faculties by our damp climate, so inhospitable to foreign visitors. This monster at first aroused no special interest in any one of us. Most probably she thought it was made of diamonds. The owner of the crocodile, a German, came out and looked at us with an air of extraordinary pride. This quite nonsensical observation I ascribe also to the extremely good-humoured mood which had overtaken Ivan Matveitch, who was on other occasions of rather envious disposition. “I fancy your crocodile is not alive,” said Elena Ivanovna, piqued by the irresponsive stolidity of the proprietor, and addressing him with a charming smile in order to soften his churlishness — a manoeuvre so typically feminine. “Oh, no, madam,” the latter replied in broken Russian; and instantly moving the grating half off the tank, he poked the monster’s head with a stick. Then the treacherous monster, to show that it was alive, faintly stirred its paws and tail, raised its snout and emitted something like a prolonged snuffle. “Come, don’t be cross, Karlchen,” said the German caressingly, gratified in his vanity. “But he won’t bite you if you do dream of him,” the German retorted gallantly, and was the first to laugh at his own jest, but none of us responded. “Oh, don’t be afraid, my dear!” Ivan Matveitch called after us, gallantly displaying his manly courage to his wife. “This drowsy denison of the realms of the Pharaohs will do us no harm.” And he remained by the tank. What is more, he took his glove and began tickling the crocodile’s nose with it, wishing, as he said afterwards, to induce him to snort. The proprietor showed his politeness to a lady by following Elena Ivanovna to the case of monkeys. A door at the rear of the room opened at this cry, and the Mutter, a rosy-cheeked, elderly but dishevelled woman in a cap made her appearance, and rushed with a shriek to her German. A perfect Bedlam followed. Elena Ivanovna kept shrieking out the same phrase, as though in a frenzy, “Flay him! flay him!” apparently entreating them — probably in a moment of oblivion — to flay somebody for something. The proprietor and Mutter took no notice whatever of either of us; they were both bellowing like calves over the crocodile. “He did for himself! He will burst himself at once, for he did swallow a ganz official!” cried the proprietor. “Unser Karlchen, unser allerliebster Karlchen wird sterben,” howled his wife. “We are bereaved and without bread!” chimed in the proprietor. “Flay him! flay him! flay him!” clamoured Elena Ivanovna, clutching at the German’s coat. I must own I was intensely indignant at the sight of such egoism in the German and the cold-heartedness of his dishevelled Mutter; at the same time Elena Ivanovna’s reiterated shriek of “Flay him! flay him!” troubled me even more and absorbed at last my whole attention, positively alarming me. I may as well say straight of that I entirely misunderstood this strange exclamation: it seemed to me that Elena Ivanovna had for the moment taken leave of her senses, but nevertheless wishing to avenge the loss of her beloved Ivan Matveitch, was demanding by way of compensation that the crocodile should be severely thrashed, while she was meaning something quite different. Looking round at the door, not without embrarassment, I began to entreat Elena Ivanovna to calm herself, and above all not to use the shocking word ‘flay’. For such a reactionary desire here, in the midst of the Arcade and of the most cultured society, not two paces from the hall where at this very minute Mr. Lavrov was perhaps delivering a public lecture, was not only impossible but unthinkable, and might at any moment bring upon us the hisses of culture and the caricatures of Mr. Stepanov. To my horror I was immediately proved to be correct in my alarmed suspicions: the curtain that divided the crocodile room from the little entry where the quarter-roubles were taken suddenly parted, and in the opening there appeared a figure with moustaches and beard, carryin a cap, with the upper part of its body bent a long way forward, though the feet were scrupulously held beyond the threshold of the crocodile room in order to avoid the necessity of paying the entrance money. But he could not complete his remarks; the proprietor coming to himself, and seeing with horror that a man was talking in the crocodile room without having paid entrance money, rushed furiously at the progressive stranger and turned him out with a punch from each fist. For a moment both vanished from our sight behind a curtain, and only then I grasped that the whole uproar was about nothing. Elena Ivanovna turned out quite innocent; she had, as I have mentioned already, no idea whatever of subjecting the crocodile to a degrading corporal punishment, and had simply expressed the desire that he should be opened and her husband released from his interior. These words, uttered with firmness and aplomb, and expressing an exceptional presence of mind, for the first minute so astounded us that we could not believe our ears. But, of course, we ran at once to the crocodile’s tank, and with equal reverence and incredulity listened to the unhappy captive. His voice was muffled, thin and even squeaky, as though it came from a considerable distance. It reminded one of a jocose person who, covering his mouth with a pillow, shouts from an adjoining room, trying to mimic the sound of two peasants calling to one another in a deserted plain or across a wide ravine — a performance to which I once had the pleasure of listening in a friend’s house at Christmas. “lvan Matveitch, my dear, and so you are alive!” faltered Elena Ivanovna. “But, my dear, don’t trouble your head about being clever; first of all we must somehow excavate you from where you are,” Elena Ivanovna interrupted. “Gott sei Dank!” put in his wife. “Perhaps out of your salary . . .” I observed timidly, but the proprietor interrupted me at once. In fact he gave himself insufferable airs. Covetousness and a revolting greed gleamed joyfully in his eyes. “I am going!” I cried indignantly. “And I! I too! I shall go to Andrey Osipitch himself. I will soften him with my tears,” whined Elena Ivanovna. “Look round! Why, is it light in there?” cried Elena Ivanovna in a tone of relief. I confess I was glad to get away, for I was overtired and somewhat bored. Hastening to offer my arm to the disconsolate Elena Ivanovna, whose charms were only enhanced by her agitation, I hurriedly led her out of the crocodile room. “The charge will be another quarter-rouble in the evening,” the proprietor called after us. “Oh, dear, how greedy they are!” said Elena Ivanovna, looking at herself in every mirror on the walls of the Arcade, and evidently aware that she was looking prettier than usual. “The principles of economics,” I answered with some emotion, proud that passers-by should see the lady on my arm. “I will explain to you,” I answered, and began at once telling her of the beneficial effects of the introduction of foreign capital into our country, upon which I had read an article in the Petersburg News and the Voice that morning. “You look perfect, and not purple!” I observed, seizing the opportunity to pay her a compliment. “An unforeseen question,” I answered, perplexed in my turn. To tell the truth, it had not entered my head, so much more practical are women than we men in the solution of the problems of daily life! It was, in short, the expression of the very natural and intelligible grief of a young and interesting wife for the loss of her husband. I took her home at last, soothed her, and after dining with her and drinking a cup of aromatic coffee, set off at six o’clock to Timofey Semyonitch, calculating that at that hour all married people of settled habits would be sitting or lying down at home. Having written this first chapter in a style appropriate to the incident recorded, I intended to proceed in a language more natural though less elevated, and I beg to forewarn the reader of the fact. THE venerable Timofey Semyonitch met me rather nervously, as though somewhat embarrassed. He led me to his tiny study and shut the door carefully, “that the children may not hinder us,” he added with evident uneasiness. There he made me sit down on a chair by the writing-table, sat down himself in an easy chair, wrapped round him the skirts of his old wadded dressing-gown, and assumed an official and even severe air, in readiness for anything, though he was not my chief nor Ivan Matveitch’s, and had hitherto been reckoned as a colleague and even a friend. I was surprised to find that he apparently knew all about it already. In spite of that I told him the whole story over in detail. I spoke with positive excitement, for I was at that moment fulfilling the obligations of a true friend. He listened without special surprise, but with evident signs of suspicion. I told him the whole story over again. Timofey Semyonitch pondered. “But how about Ivan Matveitch?” I put in, after letting the old man babble on. Timofey Semyonitch was sometimes fond of talking and showing that he was not behind the times, but knew all about things. A happy thought flashed upon my mind. “Hm! . . . Possibly as on leave and without salary . . .
Timofey Semyonitch thought a little. The old man was genuinely touched. Timofey Semyonitch was visibly more friendly. I said good-bye to the old man. Ideas of all kinds were straying through my mind. A good-natured and most honest man, Timofey Semyonitch, yet, as I left him, I felt pleased at the thought that he had celebrated his fiftieth year of service, and that Timofey Semyonitchs are now a rarity among us. I flew at once, of course, to the Arcade to tell poor Ivan Matveitch all the news. And, indeed, I was moved by curiosity to know how he was getting on in the crocodile and how it was possible to live in a crocodile. And, indeed, was it possible to live in a crocodile at all? At times it really seemed to me as though it were all an outlandish, monstrous dream, especially as an outlandish monster was the chief figure in it. AND yet it was not a dream, but actual, indubitable fact. Should I be telling the story if it were not? But to continue. It was late, about nine o’clock, before I reached the Arcade, and I had to go into the crocodile room by the back entrance, for the German had closed the shop earlier than usual that evening. Now in the seclusion of domesticity he was walking about in a greasy old frock-coat, but he seemed three times as pleased as he had been in the morning. It was evidently that he had no apprehensions now, and that the public had been coming “many more”. The Mutter came out later, evidently to keep an eye on me. The German and the Mutter frequently whispered together. Although the shop was closed he charged me a quarter-rouble. What unnecessary exactitude! “Are you alive, are you alive, my cultured friend?” I cried, as I approached the crocodile, expecting my words to reach Ivan Matveitch from a distance and to flatter his vanity. As though purposely not hearing the question, I was just beginning with sympathetic haste to question him how he was, what it was like in the crocodile, and what, in fact, there was inside a crocodile. Both friendship and common civility demanded this. But with capricious annoyance he interrupted me. “How are things going?” he shouted, in a shrill and on this occasion particularly revolting voice, addressing me peremptorilly as usual. I described to him my whole conversation with Timofey Semyonitch down to the smallest detail. As I told my story I tried to show my resentment in my voice. “Sit down on the floor if there is nothing else, and listen attentively. Resentfully I took a chair and put it down on the floor with a bang, in my anger. “You won’t find it wearisome?” I asked sarcastically. “Yes, out of my own pocket,” I answered, trying to emphasise that fact in my voice. “My wife?” he shouted, this time in a positive squeal. There was no help for it! Meekly, though gnashing my teeth, I told him how I had left Elena Ivanovna. He did not even hear me out. I must confess that, although this wild nonsense was rather in Ivan Matveitch’s habitual style, it did occur to me that he was in a fever and delirious. It was the same, everyday Ivan Matveitch, but magnified twenty times. “But the ribs, the stomach, the intestines, the liver, the heart?” I interrupted quite angrily. “My friend, oughtn’t you at least to take some purgative?” I cried involuntarily. “He is in a fever, a fever, he is feverish!” I repeated to myself in alarm. “Fever, fever!” I whispered to myself. “You are a fool,” he answered. “Savages love independence, wise men love order; and if there is no order . So frivolously and boastfully did Ivan Matveitch hasten to express himself before me, like feverish weak-willed women who, as we are told by the proverb, cannot keep a secret. All that he told me about the crocodile struck me as most suspicious. How was it possible that the crocodile was absolutely hollow? I don’t mind betting that he was bragging from vanity and partly to humiliate me. It is true that he was an invalid and one must make allowances for invalids; but I must frankly confess, I never could endure Ivan Matveitch. I have been trying all my life, from a child up, to escape from his tutelage and have not been able to! A thousand times over I have been tempted to break with him altogether, and every time I have been drawn to him again, as though I were still hoping to prove something to him or to revenge myself on him. A strange thing, this friendship! I can positively assert that nine-tenths of my friendship for him was made up of malice. On this occasion, however, we parted with genuine feeling. “Your friend a very clever man!” the German said to me in an undertone as he moved to see me out; he had been listening all the time attentively to our conversation. Ivan Matveitch, who heard the question, was waiting with curiosity for the answer; it was evident that he did not want the German to ask too little; anyway, he cleared his throat in a peculiar way on hearing my question. At first the German would not listen — was positively angry. Ivan Matveitch positively chuckled with satisfaction. Controlling myself — for I felt it was a duty to my friend — I hinted coolly and reasonably to the crazy German that his calculations were not quite correct, that if he makes a hundred thousand every day, all Petersburg will have visited him in four days, and then there will be no one left to bring him roubles, that life and death are in God’s hands, that the crocodile may burst or Ivan Matveitch may fall ill and die, and so on and so on. “No, me not intend,” said the German in stern decision. “No, we not intend,” said the Mutter, with positive malignancy. The German drew the Mutter aside to consult with her in a corner where there stood a case with the largest and ugliest monkey of his collection. “Well, you will see!” said Ivan Matveitch. As for me, I was at that moment burning with the desire, first, to give the German a thrashing, next, to give the Mutter an even sounder one, and, thirdly, to give Ivan Matveitch the soundest thrashing of all for his boundless vanity. But all this paled beside the answer of the rapacious German. After consultation with the Mutter he demanded for his crocodile fifty thousand roubles in bonds of the last Russian loan with lottery voucher attached, a brick house in Gorohovy Street with a chemist’s shop attached, and in addition the rank of Russian colonel. “Well, good-bye, then, Ivan Matveitch!” I cried, shaking with fury, and I went out of the crocodile room almost at a run. I felt that in another minute I could not have answered for myself. The unnatural expectations of these two blockheads were insupportable. The cold air refreshed me and somewhat moderated my indignation. At last, after spitting vigorously fifteen times on each side, I took a cab, got home, undressed and flung myself into bed. What vexed me more than anything was my having become his secretary. Now I was to die of boredom there every evening, doing the duty of a true friend! I was ready to beat myself for it, and I did, in fact, after putting out the candle and pulling up the bedclothes, punch myself several times on the head and various parts of my body. That somewhat relieved me, and at last I fell asleep fairly soundly, in fact, for I was very tired. All night long I could dream of nothing but monkeys, but towards morning I dreamt of Elena Ivanovna. THE monkeys I dreamed about, I suppose, because they were shut up in the case at the German’s; but Elena Ivanovna was a different story. I may as well say at once, I loved the lady, but I make haste — post-haste — to make a qualification. I loved her as a father, neither more nor less. I judge that because I often felt an irresistible desire to kiss her little head or her rosy cheek. And though I never carried out this inclination, I would not have refused even to kiss her lips. And not merely her lips, but her teeth, which always gleamed so charmingly like two rows of pretty, well-matched pearls when she laughed. She laughed extraordinarily often. Ivan Matveitch in demonstrative moments used to call her his “darling absurdity” — a name extremely happy and appropriate. She was a perfect sugarplum, and that was all one could say of her. Therefore I am utterly at a loss to understand what possessed Ivan Matveitch to imagine his wife as a Russian Yevgenia Tour? Anyway, my dream, with the exception of the monkeys, left a most pleasant impression upon me, and going over all the incidents of the previous day as I drank my morning cup of tea, I resolved to go and see Elena Ivanovna at once on my way to the office — which, indeed, I was bound to do as the friend of the family. In a tiny little room out of the bedroom — the so-called little drawing-room, though their big drawing-room was little too — Elena Ivanovna was sitting, in some half-transparent morning wrapper, on a smart little sofa before a little tea-table, drinking coffee out of a little cup in which she was dipping a minute biscuit. She was ravishingly pretty, but struck me as being at the same time rather pensive. “Why, were you? I don’t go, you know. Besides, yesterday I was visiting our captive . . . . .. I sighed and assumed a pious expression as I took the coffee. “A divorce!” I cried in indignation and almost spilled the coffee. “It’s that swarthy fellow,” I thought to myself bitterly. There was a certain swarthy gentleman with little moustaches who was something in the architectural fine, and who came far too often to see them, and was extremely skilful in amusing Elena Ivanovna. I must confess I hated him and there was no doubt that he had succeeded in seeing Elena Ivanovna yesterday either at the masquerade or even here, and putting all sorts of nonsense into her head. “But this was an unforeseen occurrence,” I was beginning, in very comprehensible agitation. And then I told her all that interesting part of my conversation the night before with Ivan Matveitch. And falling back on the sofa, she laughed till she cried. All this — the tears and the laughter-were so fascinating that I could not resist rushing eagerly to kiss her hand, which she did not oppose, though she did pinch my cars lightly as a sign of reconciliation. Then we both grew very cheerful, and I described to her in detail all Ivan Matveitch’s plans. The thought of her evening receptions and her salon pleased her very much. “It’s that swarthy fellow is going to see her this evening,” I thought. Though I had foreseen something of the sort, yet the reckless inaccuracy of the paragraph overwhelmed me. Finding no one with whom to share my impression, I turned to Prohor Savvitch who was sitting opposite to me, and noticed that the latter had been watching me for some time, while in his hand he held the Voice as though he were on the point of passing it to me. Without a word he took the News-sheet from me, and as he handed me the Voice he drew a line with his nail against an article to which he probably wished to call my attention. This Prohor Savvitch was a very queer man: a taciturn old bachelor, he was not on intimate terms with any of us, scarcely spoke to anyone in the office, always had an opinion of his own about everything, but could not bear to impart it to anyone. He lived alone. Hardly anyone among us had ever been in his lodging. This was what I read in the Voice. “Everyone knows that we are progressive and humanitarian and want to be on a level with Europe in this respect. But in spite of all our exertions and the efforts of our paper we are still far from maturity, as may be judged from the shocking incident which took place yesterday in the Arcade and which we predicted long ago. A foreigner arrives in the capital bringing with him a crocodile which he begins exhibiting in the Arcade. We immediately hasten to welcome a new branch of useful industry such as our powerful and varied fatherland stands in great need of. Suddenly yesterday at four o’clock in the afternoon a gentleman of exceptional stoutness enters the foreigner’s shop in an intoxicated condition, pays his entrance money, and immediately without any warning leaps into the jaws of the crocodile, who was forced, of course, to swallow him, if only from an instinct of self-preservation, to avoid being crushed. Tumbling into the inside of the crocodile, the stranger at once dropped asleep. Neither the shouts of the foreign proprietor, nor the lamentations of his terrified family, nor threats to send for the police made the slightest impression. Within the crocodile was heard nothing but laughter and a promise to flay him (sic), though the poor mammal, compelled to swallow such a mass, was vainly shedding tears. An uninvited guest is worse than a Tartar. But in spite of the proverb the insolent visitor would not leave. We do not know how to explain such barbarous incidents which prove our lack of culture and disgrace us in the eyes of foreigners. The recklessness of the Russian temperament has found a fresh outlet. It may be asked what was the object of the uninvited visitor? A warm and comfortable abode? But there are many excellent houses in the capital with very cheap aind comfortable lodgings, with the Neva water laid on, and a staircase lighted by gas, frequently with a hall-porter maintained by the proprietor. We would call our readers’ attention to the barbarous treatment of domestic animals: it is difficult, of course, for the crocodile to digest such a mass all at once, and now he lies swollen out to the size of a mountain, awaiting death in insufferable agonies. In Europe persons guilty of inhumanity towards domestic animals have long been punished by law. But in spite of our European enlightenment, in spite of our European pavements, in spite of the European architecture of our houses, we are still far from shaking off our time-honoured traditions. And, indeed, the houses are not new, at least the staircases in them are not. We have more than once in our paper alluded to the fact that in the Petersburg Side in the house of the merchant Lukyanov the steps of the wooden staircase have decayed, fallen away, and have long been a danger for Afimya Skapidarov, a soldier’s wife who works in the house, and is often obliged to go up the stairs with water or armfuls of wood. At last our predictions have come true: yesterday evening at half-past eight Afimya Skapidarov fell down with a basin of soup and broke her leg. We do not know whether Lukyanov will mend his staircase now, Russians are often wise after the event, but the victim of Russian carelessness has by now been taken to the hospital. In the same way we shall never cease to maintain that the house-porters who clear away the mud from the wooden pavement in the Viborgsky Side ought not to spatter the legs of passers-by, but should throw the mud up into heaps as is done in Europe,” and so on, and so on. Saying this, queer old Prohor Savvitch dived into his papers and would not utter another word. I stuffed the Voice and the News-sheet into my pocket and collected as many old copies of the newspapers as I could find for Ivan Matveitch’s diversion in the evening, and though the evening was far off, yet on this occasion I slipped away from the office early to go to the Arcade and look, if only from a distance, at what was going on there, and to listen to the various remarks and currents of opinion. I foresaw that there would be a regular crush there, and turned up the collar of my coat to meet it. I somehow felt rather shy — so unaccustomed are we to publicity. But I feel that I have no right to report my own prosaic feelings when faced with this remarkable and original incident. Story first published in Epoch magazine, 1865. Instead of page numbers, “The Crocodiles,” a novel by the Egyptian writer Youssef Rakha, is marked by 405 numbered, block paragraphs, the whole symmetrically framed by references to Allen Ginsberg. I am a ridiculous person. Now they call me a madman. That would be a promotion if it were not that I remain as ridiculous in their eyes as before.